Museo Eduardo Carrillo is pleased to start 2018 by sharing news of the Carrillo retrospective. 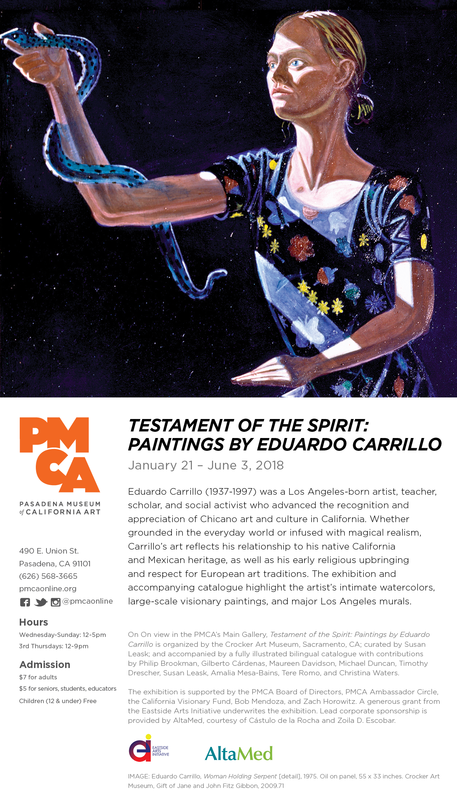 The traveling exhibition Testament of the Spirit: Paintings by Eduardo Carrillo begins January 21st at the Pasadena Museum of California Art. Exhibitions such as this cannot happen without the imagination, focused skill and planning, and hands on work of so many. Our guest curator Susan Leask and Associate Curator at the Crocker Art Museum, Kristina Gilmore. THEY MADE IT HAPPEN. Profound thanks. Lial Jones, ­Mort and Marcy Friedman Director and Scott Shields Associate Director and Chief Curator of the Crocker Art Museum who in 2008 envisioned this retrospective. Our team at the Pasadena Museum of California Art, starting with Susana Batiste, Executive Director and the energetic, “all things are possible” staff. They assembled an advisory team whose vision embraces activities in the community like the re-dedication of Carrillo’s “El Grito” mural in downtown Los Angeles. More to come. Our catalog essayists who bring vivid and thoughtful ideas to Carrillo’s art. Philip Bookman, Dr.Gilberto Cardenas, Maureen Davidson, Michael Duncan, Timothy Drescher PhD, Susan Leask, Dr. Amalia Mesa-Bains, Tere Romo and Christina Waters PhD. The Carrillo Family and our circle of lenders who have generously allowed their pieces to leave home for the extensive year and a half tour. James Pennuto, master conservator, who restored long hidden works, reviving Carrillo’s bright array of colors. Wilted & Taylor Publishing Services, the publishers of the catalog who fell in love with Carrillo’s art. It shows in every page. The shipping team ATT Howe who made sure that all the far-flung works were provided safe transit. We thank them all who have made this dream come true.